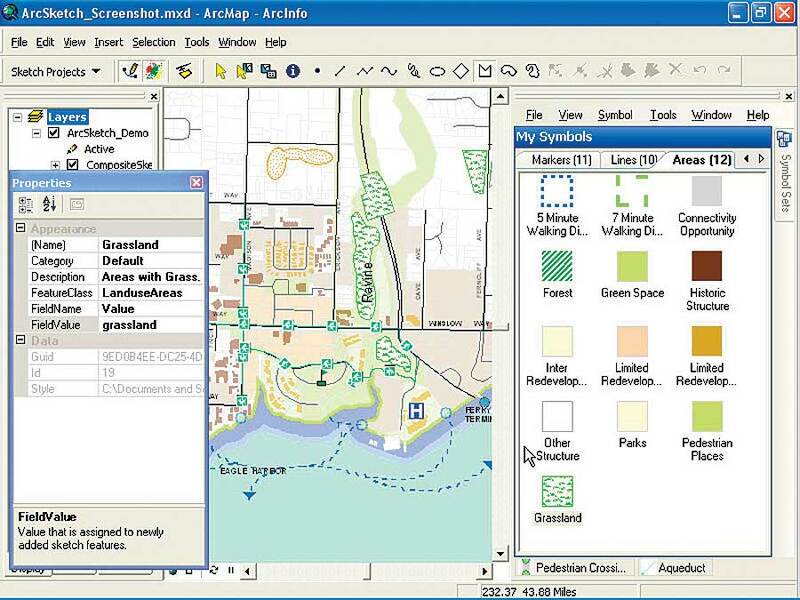 Land-use planners can use ArcSketch to do rapid scenario planning in public meetings. ArcSketch is a free sample extension for ArcGIS that gives users the freedom to do vector-based (geobased) sketching with easy-to-use drawing tools and symbols. Users can create and edit features in ArcGIS in much the same way they would if using a felt-tip pen on tracing paper. This allows users to concentrate on the forms they are trying to represent rather than the method of representation. This intuitive tool lets users quickly add features to a display in ArcGIS Desktop by sketching any combination of markers, lines, and areas on the sketch layer. ArcSketch automatically assigns features to their appropriate layers, with their appropriate attributes, based on the user-customizable symbol palette. ArcSketch automatically manages the drawing environment, allowing users to conceptualize what to draw, as opposed to how to draw it. Users simply select a symbol and an associated sketch tool, then draw the feature. These features are added to a transparent sketch layer, which is displayed over a set of background layers. ArcSketch has many applications. 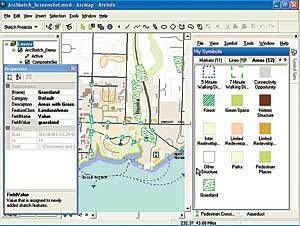 For example, city managers can use ArcSketch to rapidly develop land-use scenarios for display and analysis. First responders can use ArcSketch to quickly enter location data about different types of hazardous materials during an emergency. Transportation planners can integrate ArcSketch with their traffic flow models to conduct rapid assessment of actual and potential traffic impedances. For more information about ArcSketch or to download, visit www.esri.com/arcsketch.